I had several people interested in my green smoothie recipe, so I thought I would post my current favorite. I am not sure if it matters, but I always put my spinach in first, then the banana, then the frozen fruit. Then I put the liquid in and blend it up. This is enough for 2 smoothies. 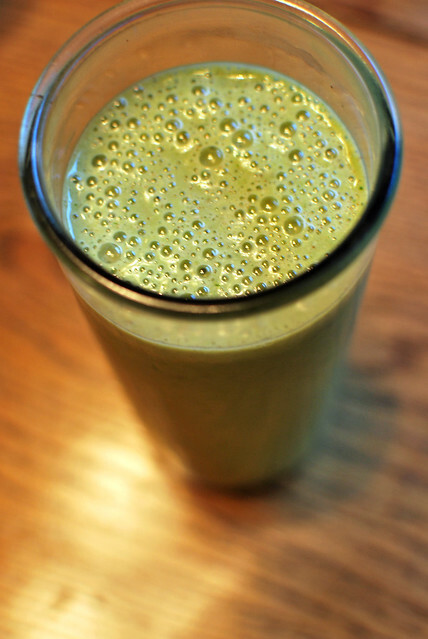 For more of my green smoothie recipes click here. Thanks for posting this recipe. As I said before, I really did enjoy your smoothie blog from long ago. I will take a look at the smoothies you have from the link you shared. I'm making this for my husband and I tomorrow morning. Awesome, thanks! Jen, thanks for the recipe. I always flirt with smashing all the stuff I 'should' eat but don't eat, into a drink. I'm like the commercials for V8 veggie drinks. mmmm...veggies in the morning. check it off the list.